Comment: During heavy rains, two bathrooms, behind my church's sanctuary, get water seeping through the walls and flooding the bathrooms and hallway carpet. The water then seeps in the carpet into the sanctuary. The bathroom floors and hallway area is lower than the outside dirt and water level (during flooding conditions). Comment: Water pools in yard during moderate rain. The level can get high enough to come into the house during heavy or prolonged rain. 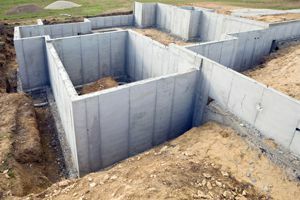 Comment: I would like to get an estimate for Project Info Task Name: Concrete Driveways & Floors - Install Request Stage Ready to Hire Desired Completion Date 1 - 2 weeks Preferred Contact Time: Any Phone - Anytime Cell Text Notification: No Detailed Description: Concrete foundation for office building. Want slicked finish. About 1200 sf. Comment: Detached Garage foundation (has almost not rebar in it, built in the 60's) is falling apart. Would love to keep the structure but the foundation needs to be repoured. Comment: Hey Guys, I need a quote to see what work needs to be on the foundation. The company who did the work are out of business and we've been left high and dry. There's been alot of movement and settling ....cracks have opened in sheet rock and an exterior wall is showing lots of movement in the brick. Richardson Foundation Contractors are rated 4.71 out of 5 based on 1,164 reviews of 47 pros. Not Looking for Foundations Contractors in Richardson, TX?